V. Serov – an outstanding portrait painter with a unique technique. His works are recognizable and convey not only the external characteristics of the characters, but also their rich inner world. The artist knew how to catch a character trait and skillfully transfer it to the canvas. 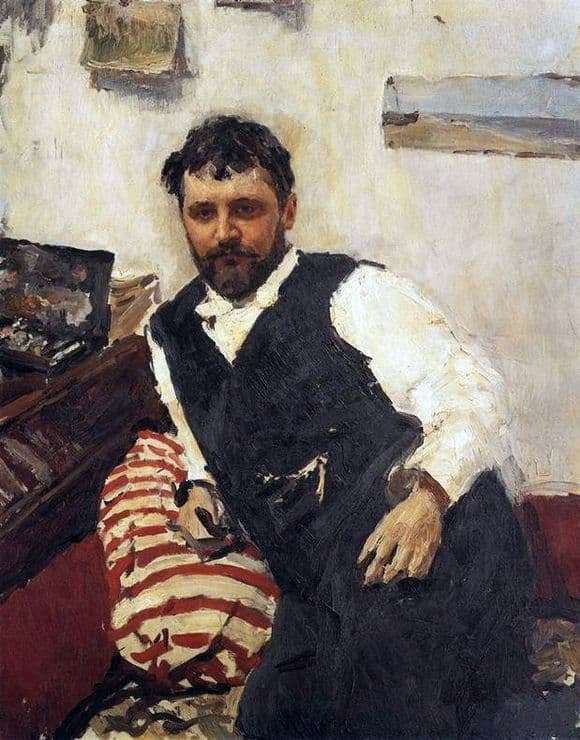 The portrait of K. Korovin is written in the standard for Serov technique, large casual brush strokes make the image a little rough, as if written in a hurry. K. Korovin was a friend of the artist, they were inseparable. Different characters and manners did not interfere with their communication. Serov was always assembled, at the same time Korovin was dispersed, of an untidy look. In the picture you can observe his unkempt hair. Recklessness and negligence successfully transferred to the artist. Korovin can hardly be called a diplomat or bank employee, he is definitely a creative person. His free posture speaks of the lack of desire to observe propriety and rules of etiquette. He feels at home, relaxed. There are studies on the table, but even if they are absent, one can guess the profession of this person. Korovin did not like to hesitate, did everything quickly and in a hurry. So he painted his paintings. Serov, in turn, worked for a long time on the canvases, all the while modifying them to perfection. The artist finished the portrait of Korovin quickly, so he decided to convey the character and fluency of a friend. Wide brush strokes make small details blurry. This technique allows you to plunge into the atmosphere prevailing when creating a picture. In the foreground, Korovin, the whole entourage is rather blurred; if it is impossible to recognize the details, you can think of them yourself. Serov managed to convey the view Korovin. He looks with mockery, his lips are tightly compressed, but his eyes are smiling. Korovin in life was a merry fellow and a joker, and his portrait reflects his cheerful disposition and attitude to life in general.